Mobile ECU Remapping throughout Cambridgeshire, Peterborough and surrounding areas. Offering bespoke re-mapping to your individual requirements. ECU Remapping Service throughout Cambridgeshire and surrounding regions: Peterborough, Ely, March, Wisbech, Whittlesey, West Norfolk, Kings Lynn, Stamford & Market Deeping. Prices from £250. Our ECU Remapping technician will connect their special laptop interface via your vehicle diagnostic port which reads your original ECU map. The original ECU map software settings are then checked, saved and corrected, then any flat spots are smoothed out then your choice of tuning level applied. This tuned remapped file is re installed on to the ECU usually within 1 hour, but can take longer in some cases. You can then test drive the vehicle, allowing you to experience and appreciate the improvements of our remapping service that has been made to your vehicle. Improve Fuel Efficiency, Reduce Your Fuel Bill and Increase Performance. 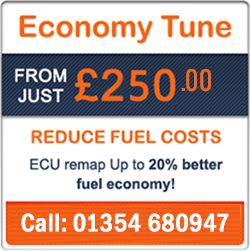 Save fuel and money with Chip and Tune ECU Remapping services and products, available for most cars. Chip and Tune have developed a unique range of tuning services which can deliver the very best in economy ECU remapping and tuning. They provide significant gains in fuel efficiency whilst improving the feel and drive-ability of the car. All manufacturers have to limit the power and mpg of their vehicles in order to adhere to the many different markets they face. From simple things such as differing fuel grades around the world to issues with marketing and affordability. So your car will always underperform both in power and for fuel efficiency. We simplify the whole issue with an expertly optimized Economy Tune on your vehicle, delivering the optimum economy for the vehicle and providing a delightful increase to the power at the same time. The most important benefit you will see is the significant fuel cost savings from Chip and Tune Economy Tuning. And it doesn’t matter whatever the price of fuel is once your car is properly tuned the more you drive with an Economy Tune, the more you SAVE! Petrol and Diesel Performance Tuning, ECU Tuning, ECU remapping and Chip Tuning. Power Tuning is essential for those drivers who feel there vehicle is not living up to its potential. By increasing the power of your vehicle you are providing yourself with a car that is safer for overtaking, more pleasurable to drive and puts the smile back on your face – without the outlay for a new vehicle. Whether your car is a small petrol engine or a big muscle car, there’s always power to be found within the engine software. The benefits of 6hp on a 1.0 litre petrol engine is as noticeable to one driver as it is for the driver of a 3.6 twin turbo with an extra 65hp+. Be it a track day superstar or the car used for the school run the benefits of a Power Tune are endless. Chip and Tune are Mobile and Static ECU bespoke remapping specialists. 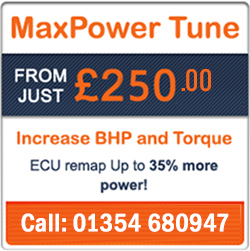 Contact us for ECU engine remapping to Improve Fuel Efficiency and Increase Performance! Diesel Particulate Filter (DPF) and EGR Services and repairs, can only be carried out at our workshops premises.